House-invading ants, nuisance ants or simply house ants. Common house ant species are: odorous house ant, Argentine ant, pharaoh ant a few other species.Most ants that invade homes are yellow, red, brown or black in color, constricted at the waist, 1/8-1/4″ long. carpenter ants that are larger than about 3/8″ (in the US) . occasionally see ants with wings (all species),considered “reproductives”. Spring has arrived along with it comes a big headache,Sugar ants making a home in the kitchen pantry. The dreaded insects are rearing it’s ugly head. The unwanted pests invasion has begun. The ants love to crawl around in kitchen cabinets all over anything sweet to bring back to the little hillsides that lead deep into the nest or nests.The sugar is then shared with the queen then other ants for nourishment. The queens need plenty of food to be ready for reproducing times. Sugar ants are tiny insects also known as pavement ants that can cause chaos inside outside of homes or other buildings. The bugs are from the family of large black ants have orange brownish bodies with black heads mandibles. Sugar ants can come in different colors, sizes, shapes depending on the roles being played. 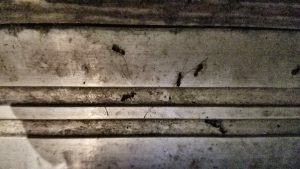 Correctly identifying the ants roaming around the kitchen is an extremely important first step in rectifying the ant problem. This is crucial because there are many different ant species. Different types of ants have different habits behaviors that can affect the type of treatment required to eliminate the armies of ants. Look at the ants in your kitchen note their characteristics. Keep this information handy for when decision time comes to get the pesky pets taken care of. The small insects love habitats that are moist, the sugar craving pests love kitchens pantries. But also like damp dark areas commonly found in urban areas.The nests can be found in old wood, the roots of plants, near twigs of trees, shrubs bushes, underneath rocks, deep beneath the soil. Finding an ant home is easy because the mounds look like a little volcano. Older homes buildings seem to attract sugar ants the most because there are more cracks to march through. But the critters can find also find wars to get into newer homes too. Cleaning keeping the business or home clean is not enough for keeping these tiny insects away. 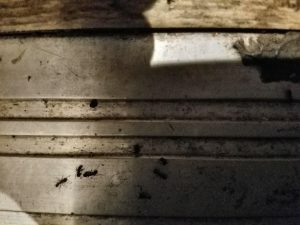 Yes there are countless home remedies but the infestation may need a Pest control professional to evict the armies of sugar ants that are invading the home or business. It may be time to contact a professional pest control specialist. Sugar ants are not dangerous to humans. The worst that can happen is getting a bite that leaves a little red mark. The bite is not painful or life threatening. Unlike bites from some other ants.Older homes buildings seem to attract sugar ants the most because of having more cracks to sneak through. But the critters can find a way into newer homes too. Cleaning keeping the business or home clean is not enough for keeping these tiny insects away. Yes there are countless home remedies but the infestation may need a Pest control professional to evict these pests. In the meantime make sure to cover or seal all food. Do not leave dirty dishes around, no pouring sweet liquids down the drain as the sweet nectar can leave a film that gives the ants a delicious treat. Store your dried goods such as cereals, fruit granola bars, cookies other perishables sealed tight. Sugar ants measure approximately 2.5 to 3 mm in length have brown to black bodies, pale legs antennae. Little black ant pest control is achieved by understanding ant extermination control. Pavement ants earned their name because they nest in cracks in driveways under sidewalks, piling the resulting dirt in a mound on top of the pavement. Pavement ants also dwell in the undersides of logs, bricks, stones, patio blocks boards. Pavement ants may also nest under mulching or open soil close to building foundations. They also can nest indoors, such as under floors, inside insulation within walls. Pavement ants invade buildings while foraging for food. Nests are outdoors under stones, along curbs or in cracks of pavement, nesting indoors in walls under floors.Pavement ants will feed on a wide variety of foods, including meats, grease, live dead insects, seeds honeydew from aphids. Eating greasy foods, can eat many foods consumed by humans. Forage for food for their colonies set up trails to food sources from their nests. Pavement ant workers enter houses to forage can become a nuisance when large groups infest a kitchen or garden patio. Pavement ants undergo complete metamorphosis, passing through the egg, larval pupal stages before becoming mature adults. 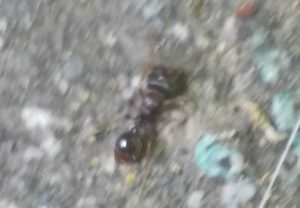 A typical colony of pavement ants includes multiple queens numerous workers. A queen establishes a new colony of pavement ants by laying eggs. Small tiny worker ants then tend the queen’s brood till develop into adults. During their development, broods are transferred from location to location to protect them from fluctuations in moisture temperature. The odorous house ant is probably the most common house-infesting ant species in seattle. The name comes from the odor of rotten coconut that is noticeable when you crush the insects. Workers are about 1/8” long brown to black in color. There is one node on the pedicel that is hidden by the overlapping abdomen. Colonies may contain several hundred to 100,000 workers contain multiple queens. New colonies are formed primarily by budding; however, occasional mating swarms may occur in late spring. Odorous house ants can nest in many different places. Outdoor they may build their nests in mulch, in piles of logs, firewood, boards, other debris. Also nest beneath stones, sidewalks, patio blocks, concrete slabs. Indoor nest sites may include wall voids, window frames, in insulation in an attic or between bats of insulation crawlspace subflooring. Indoors, odorous house the ants are typically attracted to sugary food items. Outdoors, feed on the honeydew secreted by aphids other insects on shrubs trees. From stats of pest control the ants most business homeowner are having trouble with are Pavement Ants Pharaoh Ants, for the purposes of maintaining simplicity refer to both Pharaoh Pavement ants as Little black sugar ants. Ants are controlled killed the same way taking advantage of their appetites.Getting rid of little black ants, however,its is as easy as getting rid of sugar ants. Sugar ant control is very much a matter of daily routine during the months when sugar ants are a problem (March through September), particularly in the kitchen.Ants invade your kitchen cabinets crawl all over your sweet treats grabbing bits of sugary goodness to take back to their little hillside borrow that leads deep into their nest. The sugar is then distributed to other ants the queen ant to feed on so she can be nourished produce more little sugar ants. unsightly hordes/trails of ants causing further contamination. Throughout the year, indoor nests of pavement ants can produce winged reproductives that swarm by windows other light sources, creating an unwelcome sight potentially forming new colonies in or in areas around a structure. Sealing up the foundation any cracks around windows doors. Replace decaying wood frames shingles. Roof is old damaged, it is best to replace that too. Place opened boxed bagged goods such as cereals, cookies, fruit snacks chips into sealed containers or bags. Store flours sugars in airtight baking storage containers. Store honeys, syrups molasses product in the refrigerator just gently warm them up when you need to use them. Store breads baked goods in the refrigerator or bread boxes that seal up. Never dump sugary foods down the garbage shoot in the sink because it will leave a sticky residue attract ants. Keep open sodas, juices, coffees teas in the refrigerator. Wiping down kitchen surfaces such as the microwave, stove, refrigerator, counter tops, tables, chairs floors can keep sticky sweetness away, which helps keep the ants away. The most common ant baits used to get rid of sugar ants are called sweet baits, the most common ingredient found in sweet ant baits is boric acid, or Borax. Most household ants (pharaoh ants, pavement ants, little black ants included) are prone to the poison known as Borax. Borax is a mineral mined in the deserts of California, refined dissolved into all manners of ant bait systems. It is generally non-toxic to humans, though I wouldn’t recommend inhaling or ingesting large amounts of it. It is a slow-acting poison, which means that when the ants eat the bait (usually corn syrup), the poison doesn’t kill the ants right away. The ants take some of the sweet bait back to the colony with them dispense the poison meal to other ants. This is how colonies of ants are exterminated, sugar ants are the easiest ants to kill because they’re small, voracious scavengers. If you want to get rid of sugar ants or kill a sugar ant colony quickly, research Terro brand sugar ant baits at affordable price from Amazon. Using vinegar to clean instead of bleach is a good way to naturally control sugar ant invasions. Acetic acid, the acid in vinegar that makes it smell so strong, not only naturally deodorizes (or odorizes, as the case may be), but is one of nature’s most powerful cleaning agents. We recommend using vinegar instead of bleach on How to Clean Things all the time, nothing can be more repulsive to sugar ants than a little white vinegar. Make sure you use White Vinegar, not apple cider vinegar or something like that. The less sugar the better. control then it is wise to contact a Professional Exterminator to take care of the Ants in the kitchen. outside the main thing to do is to locate the nests. Discovering the nest or nests is a priority in order to apply the pesticide treatments directly onto the nests. Again, there are several types of home remedies over the counter products to eliminate the ants but not all will be successful. Locating the best Ant Pest Control expert is what’s needed , AMPM Exterminators are the professionals to call.